Where can I find the latest PC driver for my Razer Raiju so I can play Non-Steam games? The Razer Raiju features plug and play support when playing games on Steam. For playing games on you PC outside of Steam please download the Raiju driver here. IMPORTANT: Please note that drivers and updaters for this Raiju is intended for this specific version only and will not work with Raiju Tournament Edition and Raiju Ultimate. Why are my triggers not working after enabling the trigger stops? To disable the "Hair Trigger mode," please follow the above steps but press "O" button instead of "X" button. Can I enable force feedback when using my Razer Raiju on PC? Force feedback is currently only supported on PlayStation 4 and will be supported on PC in a future firmware update. Please stay tuned! How do I optimize the chat experience on my Razer Raiju? Every audio headphone will have different microphone gain settings. For an optimal experience, please adjust the microphone level on the PS4 console until you see the signal registering in the "Good" region when you speak into the microphone. Go to "Settings" > "Devices" > "Audio Devices" > "Adjust Microphone Level." Hit "O ENTER" after adjusting to save the setting. Can I use my Razer Raiju on the PC? Absolutely! Your Razer Raiju is fully compatible on any computers running Windows 7 onwards. 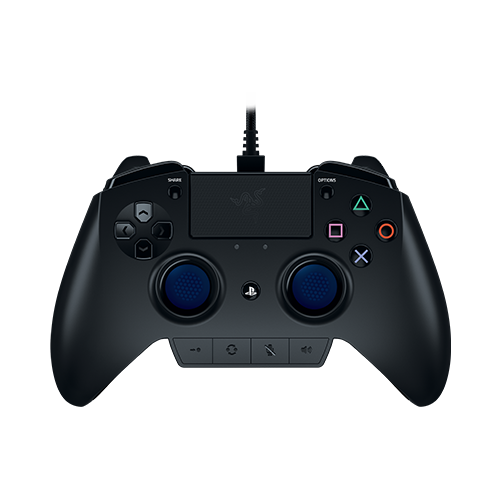 Can I use my Razer Raiju on Steam as a PS4 controller? Find "Razer Raiju" under "Human Interface Devices"
Select "Let me Pick from a list of device drivers on my computer"
Choose "HID-compliant game controller" and click "Next"
Can I use my Razer Raiju on PC games outside of Steam? Find "HID-compliant game controller" under "Human Interface Devices"
Select "Search automatically for updated driver software"
If you're still experiencing issues with your Razer Raiju, please contact our team for further support at http://www.razersupport.com/contact-us/. Does button re-mapping, trigger sensitivity, and headset volume / mic mute functions all work on PC? Absolutely! You shouldn't have any problems using all of these features on your Razer Raiju regardless of whether you are on your PC or PlayStation 4. Are there any limitations when it comes to using the Razer Raiju on PC? The only limitations that you may encounter would be within games that do not allow third-party controllers, although this is a very rare occurrence and depend on the game developer. How do I disable the back buttons on the Razer Raiju to prevent accidental presses? This will effectively disable the MFB/MFT and can be repeated on the other button. To enable, please perform the same steps, but assign them to a button (but not the PS button). I'm hearing some white noise when listening to audio from the Raiju's audio port, especially when at high / max volumes. What is happening? We have a firmware updater available that can fix that issue for you! You will be required to download it to a Windows PC before you can use it to update your Razer Raiju. Once downloaded, simply follow the instructions from the update, it will guide you through the process. Do ensure the Raiju controller is unplugged from your computer before you begin. Here is the download link for the firmware updater. We cannot help you in modifying or disassembling your Razer product since doing so will void the manufacturer's warranty of the product. For a complete list of our current spare parts and accessories please click here. If the item you need isn't listed, please don't hesitate to contact our Customer Support team here. If you were unable to troubleshoot and resolve any issues you are having with the knowledge base (FAQ) and you feel your product is still defective, please don't hesitate to contact us here or call 1-888-697-2037. My Razer product does not work correctly with a specific program or game. What should I do? If you are experiencing issues with the Razer device in a particular application, test the device in another application to confirm if the issue is specific to that application. If the Razer device functions properly in another application then the program is likely the cause of the issue. Please feel free to contact Customer Support at http://www.razersupport.com/contact-us/ to report the issue and see if there are any fixes or workarounds for the issue. If you're unable to find an FAQ article that helps resolve the issue, please contact our Customer Support team here. User guides and product manuals are also available on the Support page. A valid proof-of-purchase is defined as a dated sales receipt from an authorized Razer Reseller. The receipt must show the 1) product description and 2) price. Invoice slips and e-mail order confirmations can be considered on a case-by-case basis. Razer must verify that the product is within the specified warranty period and that it was purchased from an authorized reseller. Products purchased from unauthorized dealers are often used, counterfeit, re-boxed, defective or gray market goods. These units may also not be designed and packaged to work in your country and may not meet all legal and safety requirements. Razer will not be able to honor a warranty on products purchased from an unauthorized dealer or that are out of the warranty period.